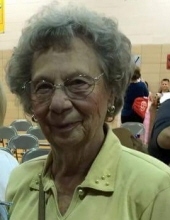 Doris L. Darling passed away on November 15, 2018, she was 95 years old. She was born on October 12, 1923 to her parents, Benjamin Danford and Eva Miller. She loved to needlepoint and go fishing and travel. One of her favorite vacations was a cruise to Alaska. She loved spending time with her family, her great niece, Amy and her two daughters. She had a 3 legged cat named max that is 14 years old that she loved. She was preceded in death by her parents, husband, Robert Darling, her sister, Thelma Larson (Danford), her niece, Cynthia McClaskey, and her great-great niece, MaKayla McCloud. She is survived by her great niece, Amy, and her two great-great nieces, Taylor Ann Marie Arbona and Paislee Kay Lamb. A graveside ceremony for Doris will be held at 2:00 pm on Monday, November 19, 2018 at the Odd Fellows Cemetery in Ponca City. Arrangements are under the direction of Trout Funeral Home & Crematory. To send flowers or a remembrance gift to the family of Doris L. Darling, please visit our Tribute Store. "Email Address" would like to share the life celebration of Doris L. Darling. Click on the "link" to go to share a favorite memory or leave a condolence message for the family.